Our "home away from home" when visiting the Seneca Lake area. Originally a beer bar, the owner started to brew his own and a fine job he's done. The cream ale is nice and mellow and the stout is rich and satisfying. The IPA is decent and they had an amped-up IPA that was outstanding. There is also a decent selection of taps & bottles. Best popcorn on the lake. There is also some live music on occasion but we like to hang out and talk to the wine tour folks as they pass through. See you there! 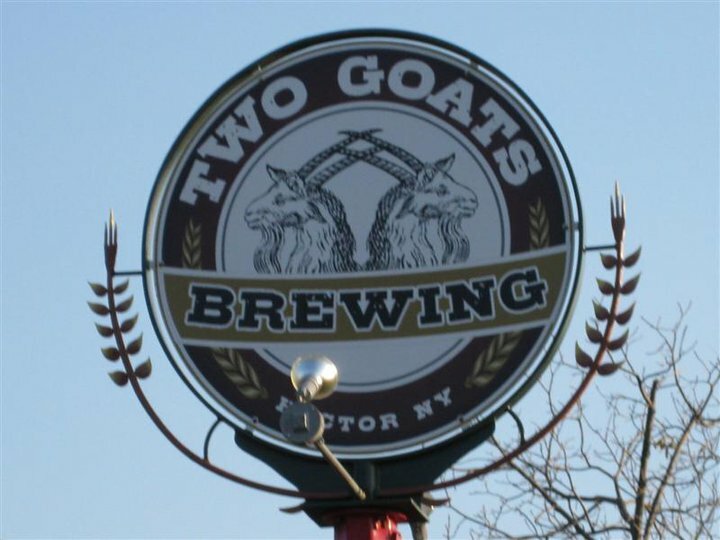 Two Goats is a nice little brew pub right on Seneca Lake. Unlike a lot of the other breweries on the Finger Lakes, this one is meant for the locals - not for the buses of wine tourists - and I really enjoyed that. There was a small selection of maybe 2 or 3 beers on tap. We also got some food, and since there was only one food item on the menu, we all had the roast beef sandwich. The roast beef was sliced behind the bar right in front of our eyes, and overall the sandwich was surprisingly tasty (although fresher bread would have been nice). Brake when you see this sign.